Life is sweet at a nursery in North Yorkshire as colonies of bees have been busy creating their first batch of honey. Johnsons of Whixley installed an apiary at its 220-acre nursery three months ago as part of a project in partnership with Harrogate and Ripon Beekeepers Association, which recognises the crucial role bees play on our eco-system. The family-run business installed the apiary to help the UK’s bee population and is now very close to seeing its first batch of honey. Harrogate and Ripon Beekeepers Association has been visiting the nursery fortnightly to check up on the bees. The team at Johnsons of Whixley is looking forward to trying the first batch once the honey is ready. Honey can be used for a variety of purposes; from medicinal use such as treating wounds and allergies, to beauty purposes such as hair conditioners and lip balms. And of course, it can simply be used to sweeten up food such as toast and pancakes. Bees are a vital part in the world’s food production as studies have revealed that around a third of the world’s food is pollination dependent. “We’re excited to see that the first batch of honey is almost ready and we’re looking forward to trying it! 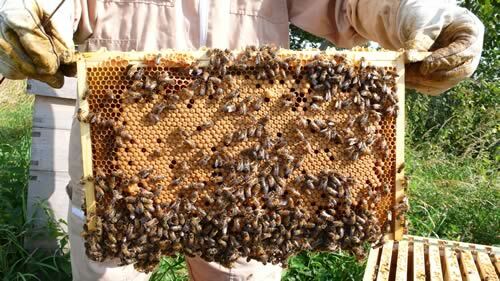 “The bee colonies at Johnsons of Whixley have made good progress following a slow start to the year and I am hoping for a good first harvest from them. “Honey bees have many problems to face in their short lives, with the loss of wild flowers and the increase in the various external factors effecting their survival, a site such as Johnsons which offers so many nectar and pollen producing plants will help the long term survival of the honey bee.